People do all sorts of nutty things when they’re raising money for charity. Anything that grabs the attention of potential sponsors in a quirky or innovative way works best, which is why Project Cirrus is sure to hit the fundraising headlines. It’s the name that’s been given to Fraser Corsan’s world record attempt, which involves beating no less than four wingsuit world records in the space of just two jumps. As a result, Fraser will be on target to raise a chunk of funds for SSAFA, the Armed Forces charity. To carry out this amazing feat, Fraser will be utilising a specially produced wingsuit that has been created by the Phoenix-Fly company. Squeezed inside the suit will be Fraser, along with plenty of tech from his current employer Fujitsu to ensure that he gets it right first time, and lands safely at the end of each record breaking sessions too. Of course, he’s put in plenty of skydiving practice before all this, with at least 500 jumps being recommended before you even think about donning a wingsuit. Nevertheless, Fraser will need to be keeping an eye on quite a lot of data and analytics as he pilots himself back down to earth. He’ll have his hands full, put it that way. Typically, jumps are from 13,000 feet, whereas Fraser is aiming is aiming to plummet from over 40,000, while covering a distance flown of about 20 miles, which is just over the existing 19 mile record. That’ll let him beat the existing highest altitude jump of 37,265 feet, which is the sort of height that commercial airliners cruise at. Normally, during these lightning-fast excursions, he would clock up speeds of about 80 to 120 miles per hour. But, Fraser hopes to reach a targeted speed of 250 miles per hour – currently the highest speed reached in a wingsuit is 234mph. The time taken for all of this to happen is a targeted 10 minutes, which will also enable him to beat the existing record of 9.06 minutes. 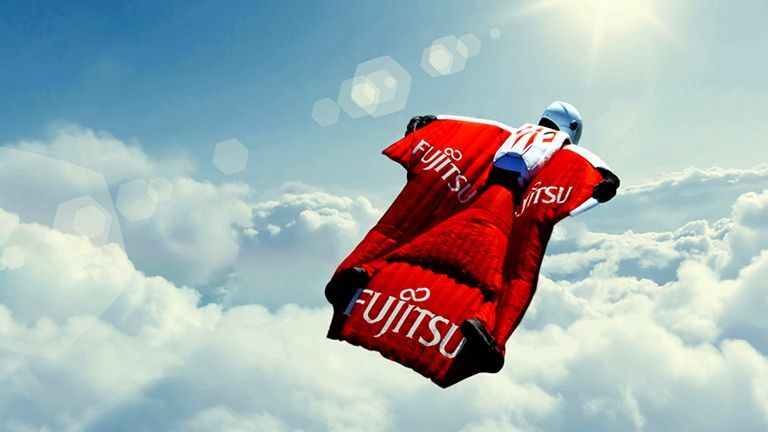 As you’d expect, the wingsuit itself is a custom design that bristles with high-tech features. It’s made from ultralight coated rip stop Nylon fabric that reduces drag, fends off snags and tears and is super-light into the bargain. There are carbon-fibre wingtip grippers and small blades that allow increased wing size whilst retaining the all-important tension to keep it in the air. Similarly, semi-rigid intakes boost the rigidity and flight performance of the wingsuit, while a rigid 3D-shaped leading edge offers lift and reduced drag to help propel Fraser like a dart through the air. Lateral stability is maintained with the aid of a central inlet hole that manages airflow as efficiently as possible. Thankfully, the arm wing and tapered sleeves will allow Fraser to deploy his main parachute when needed. Central to the tech side of things is a small but vital bit of kit in the shape of FlySight. This is a GPS receiver that gives Fraser real-time audible indications of vital signs, such as glide ratio and horizontal or vertical speed. It’s activated minutes before the jump and, as soon as Fraser gets underway, he’s subsequently able to tweak and fine-tune his body position to achieve the best momentum. Feedback to him comes via two small headphones integrated into a high-altitude helmet. The design also provides him with thermal and impact protection. That’s just as well because Fraser can expect a wind chill temperature of around -137 degrees, which is considerably colder than your average deep freeze. He’ll also need to have Class A airspace clearance and a virtual space corridor of just 30 minutes in order to carry out the attempt. The ‘slot’ gives him a 25-mile-long and 5-mile-wide window of opportunity. Fraser has been doing around 10 jumps a week in the run up to the record breaking event, which has been allowing him to hone his skills and ensure everything works as expected come the big day. An additional 100 endurance flights were also factored in to the final run-up to make absolutely sure his systems work as expected. And, naturally, the four wingsuit world record attempt will also require perfect weather conditions to happen. Fraser can keep tabs on the all-important altitude stats using an audible altimeter called the Visio along with a visual Altimeter called the Military Altitrack from Larsen and Brusgaard. Meanwhile, GPS tracking will transmit his position to the team on the ground so that Fraser can be met when he lands back down on terra firma. And, after 1,300 flights to date, let’s hope this one is his biggest and most successful ever. All donations will go directly to SSAFA, the Armed Forces charity.